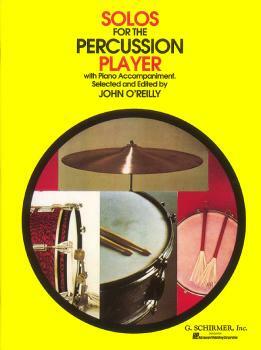 Compiled by John O'Reilly for various percussion instruments with piano. Contents: SNARE DRUM: The Phantom Drummer (Weinberger) • Two Unaccompanied Solos (Colgrass) • Introduction and Rondo (O'Reilly) • Metal 'N' Wood (O'Reilly) • MULTIPLE PERCUSSION: Two for One (O'Reilly) • Trinote (O'Reilly) • Fireworks (O'Reilly) • TIMPANI: Lament (O'Reilly) • Primeval Dance (O'Reilly) • Three Designs for Three Timpani (Muczynski) • Sonata for 2 or 3 Timpani and Piano (Tcherepnin) • Two Pieces (Carter) • MALLET PERCUSSION: Gymnopedie (Satie) • Allegro (Loeillet) • Adagio and presto (Handel) • Cool (Bernstein) • Tarantella (Prokofiev) • Scherzo (O'Reilly) • Concertino, Op. 21 (Creston).